2014, de Gruyter, Berlin and New York, 109 p.
New aspects of Japan’s immigration policies: is population decline opening the doors? This paper examines the possible impacts of rapid aging and population decline on Japan’s immigration policies. It is commonly understood that Japanese governments have shown a considerably restrictive attitude toward the acceptance of foreigners. In fact, immigrants and even foreign workers were not officially accepted in Japan unless they were highly skilled professionals. At the same time, recent initiatives such as the Economic Partnership Agreement about foreign health care workers from Indonesia and the Philippines, the third-country refugee program, and the point system for highly skilled foreign workers have shown a previously unseen dynamic in the respective policy fields. Similarly, a larger number of policy recommendations have called for changes of the current system and the official recognition of immigration. Do these developments signal a turn in Japanese immigration policies? This paper gives a comprehensive overview of the current state of Japanese immigration policies. Considering the background and the consequences of recent policy activities and recommendations, it will be argued that the Japanese government even now is not intending to open the country to foreigners. This adhering to past principles is attributable to difficulties in consensus building and a strong reluctance to make the topic as such a political issue. These problems can be observed not only on the level of the ministries and government offices, but also between and within the political parties. On the surface, Japan continues to be a non-immigration country. Economic migrants are never admitted as permanent residents at the point of initial entry and rarely viewed as immigrants any time afterward. At the same time, however, Japanese immigration policy has become markedly settlement oriented since the mid-2000s. The government has managed to cobble together a series of initiatives the total of which now has the appearance of an integration policy mostly targeting co-ethnic migrants, so-called nikkeijin. The country has also introduced a new points-based system which confers immigration privileges, such as family sponsorship and expedited access to permanent residence, on highly skilled migrants. By pointing at these policy examples, I demonstrate that Japan has become a de facto immigration country where some migrants are denizens or expected to become so. The present aim, then, is to explain why and how this shift has occurred despite the stasis which characterizes the policy façade. I argue that these changes are best understood as react- ive and incremental adjustments to unexpected outcomes of earlier policy deci- sions on the admission of both unskilled and highly skilled workers as temporary migrants. Being both foreign and female, Chinese highly skilled women face double discrimination in corporate Japan. Yet this study argues that due to their transnational networks and expertise they turn unfavorable circumstances for work–family balance into strategies to improve work–career compatibility to a degree still unattainable for many Japanese women. While outcomes thus seem rosy from a labor market perspective, these strategies come at a cost both for the women and for the Japanese labor market. Strategies include leaving Japan to join the Chinese labor market, family separation, and delayed marriage or childbirth. In this paper, I examine Chinese agricultural labor migrants’ experiences in rural Japan. The research is based on multi-sited ethnography, mainly in Kawakami, a village located in central Japan, from July to November 2012. I go beyond the labeling of Chinese migrants as passive victims of difficult work conditions and exploitation, which pervades much of the literature on international migration, and argue that Chinese peasant workers possess an agency to negotiate, navigate, and survive in the village. The strategy they take is to contest over local institutions to build up their own “places,” where they can find provisional security, a sense of relief, and mutual support. These “places” further facilitate the formation of the social networks among the workers, although this is officially repressed by the dominant society. A functioning social network plays a significant role to help workers adapt, overcome difficulties, and exercise their agency in a more effective way. When in August 2008 a group of 208 Indonesians undertook hands-on training in nursing and eldercare in Japan under the provisions of the Economic Partnership Agreement (EPA), their arrival fed directly into debates over the appropriate means to tackle the various projected problems coming with Japan’s aging society and declining population. In this light, the EPA scheme, offering an unprecedented possibility for the Indonesian workers to remain in Japan permanently, came to be debated in terms of Japan’s stance on immigration and Japanese self-representations as a nation. As such, although numerically insignificant and officially not aimed at supplementing the Japanese labor market, the scheme triggered debates over the future shape of Japanese society, and how, and whether, foreigners could be included in it. Against this background, in this article I consider the relationship between the demographic changes and the way a nation imagines who can or should belong. I suggest that the media representations of the EPA trainees and the debates surrounding the program were expressions of particular ideologies of a Japanese nation trying to position itself the projected demographic changes and globalizing processes, which brought about a need for a redefinition of certain representations of contemporary Japanese society. Japan faces population aging and shrinking. It is in particular the workforce that sees a rapid numerical decline. The manifold challenges that arise from this development are well researched, and so are most of their potential countermeasures. One of these, however, seems to be only marginally present in the discourse about Japan’s demographic change, if at all: the discourse about international labor migration. De jure, Japan does not allow for larger, systematic influxes of foreign workers. De facto, however, migration does take place through a variety of (mostly legal) channels. The economic impact of international labor migrants is cherished, yet politics and society at first glance still largely ignore their existence. 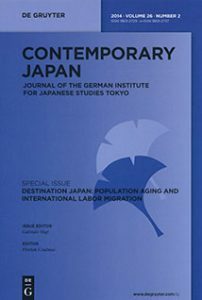 This special issue of Contemporary Japan focuses on how Japan copes with population aging and a shrinking workforce in an age of accelerated international migration flows. Questions that are being addressed include the following: What are the reasons behind the prevailing gap between the positioning of political, economic, and societal actors toward international migration to Japan? How does Japan’s demographic change impact the nation’s migration policy? To what extent does public opinion shape the political developments?